We know a lot of volcanoes in Indonesia. Visiting all the volcanoes is not possible. I visited two active volcanoes, Kelud and Bromo, on the island of Java. 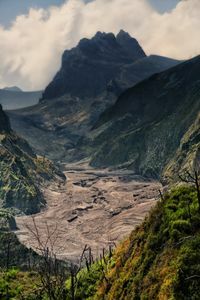 The low volcano Kelud (1731) Kediri, has a very bad, completely unpredictable character and has erupted about 30 times over the past seven hundred years, killing more than 15 th. people. Kelud is really dangerous and the facts of history have more than once confirmed it. 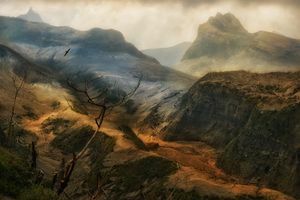 Kelud appears as both the most terrible and the most beautiful volcano in Indonesia. The most catastrophic eruption was 1929. 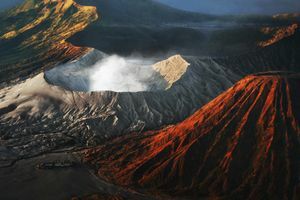 Active volcano Bromo - one of the most popular volcanoes in Indonesia. The crater Bromo is much easier to look, than other craters of volcanoes. Together with other calmer volcanoes fumed Bromo is a spectacular sight from the lookout on Mount Penandzhakan. Bromo is an active volcano in Indonesia, part of the Tenger volcanic complex. Located in the east of Java. It has a height of 2392 meters. 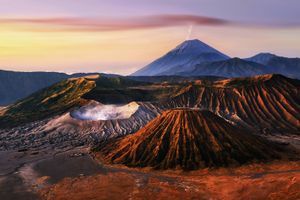 Bromo Volcano is a part of the Bromo-Tengger-Semeru National Park. The volcano has been in a state of constant activity for the last 20 years, its crater is filled with smoke from active fumaroles.